In part one of the making your tops and dresses fit you while you lose weight series, we primarily devoted our time to tanks. 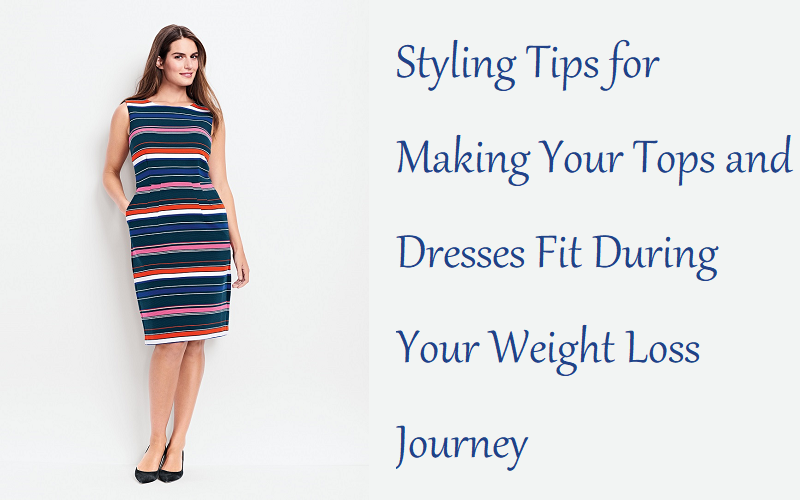 In part two, we are going to focus on making one fashion accessory change the style of your dresses and tops as you lose weight. No, it's not the belt. I want to give you a couple of tricks to make that good old fashion scarf work harder for you. I could tell you the easy thing about wrapping a scarf around your waist and tying it in the front or the side to cinch the waist of long tunics or dresses. However, cinching the waist is a common thing to do and I touched on it in my first post. This time around, I am going to discuss wrapping the scarf around you to change the look of your tops and dresses. For dresses and tunics: An easy one is to take a long scarf or several long scarves if want to be fancy to change the look at the waist. Wrap your scarf around your waist until you have a sash that is around four to five inches wide. Tie your scarf in front or to the side. If using multiple scarves, tie each scarf individually then twist or braid them together and secure the end of the twist or braid with an elastic band. Any style of dress or top: My second wrapping option is taking it to the top half of your body. This time you are making the sash you made at the waist, around your bust. Here you will start wrapping an inch below your underarms; wrapping down until you are two and half inches under your breasts. With this wrap, you can tie it off anywhere you like. You can tie center front, on the side, or even (with some help) at center back. Optional Tip: If you can find a cheap, knit mini skirt that will fit around your waist or around your bust, this is the easiest option. If you find that these styling tips in parts one and two are too much work for you and you'd rather just go buy some new clothes every other month, that's fine. Still don't get rid of those knit tops and dresses just yet. You can use them as headwraps . I've already begun doing this and it really can pull together a look for you. Try it. You might like it! As always, if you have any questions leave them in the comments or PM the Fashion’s Sense Facebook Page.